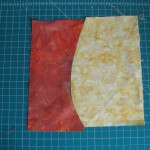 CURV ED PIECING is one of my favorite characteristics of contemporary quilting. 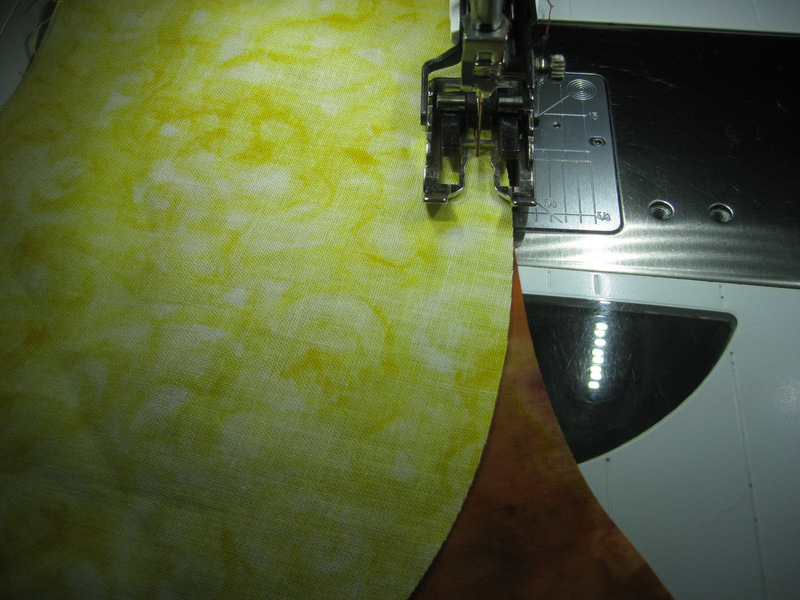 Traditional quilting relies almost completely on straight edge piecing but unlimited options open up when you begin to sew curves. 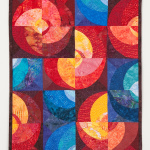 Curves can be small wiggles or whole circles though often whole circles are made with four blocks of quarter circles (see quilt in photo). 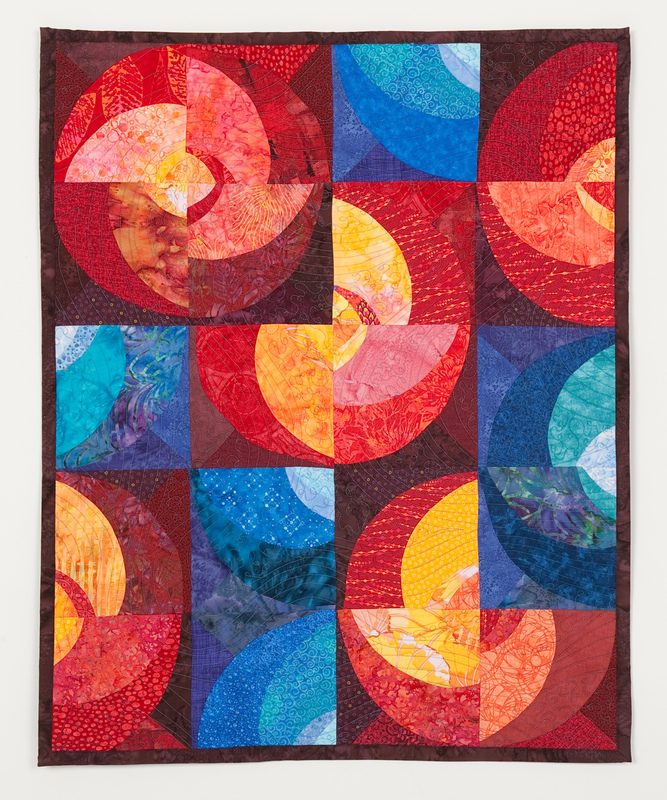 Curved may create layered colors in your design, as you see in one of my sunset quilts, or they may depict actual circles as shown in another quilt pictured here. 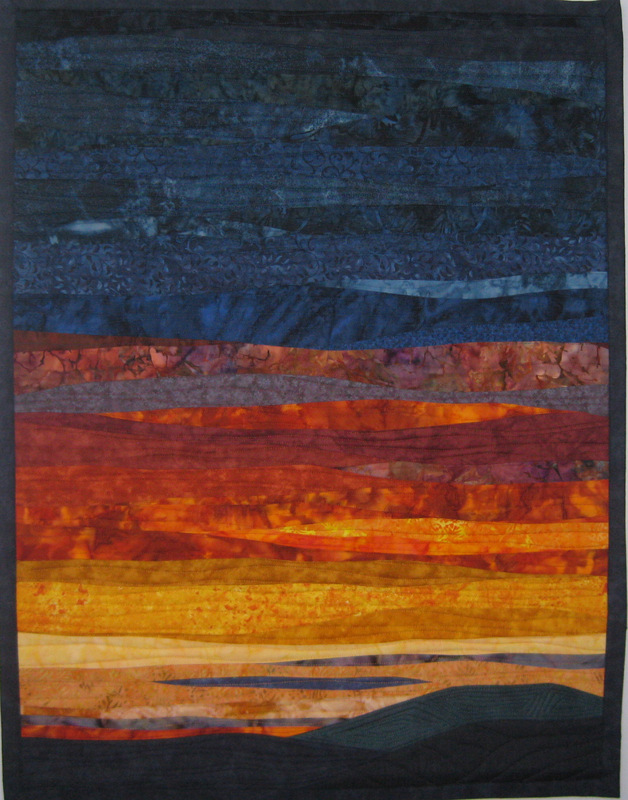 Curves provide interest, color blending and depth to contemporary quilts. 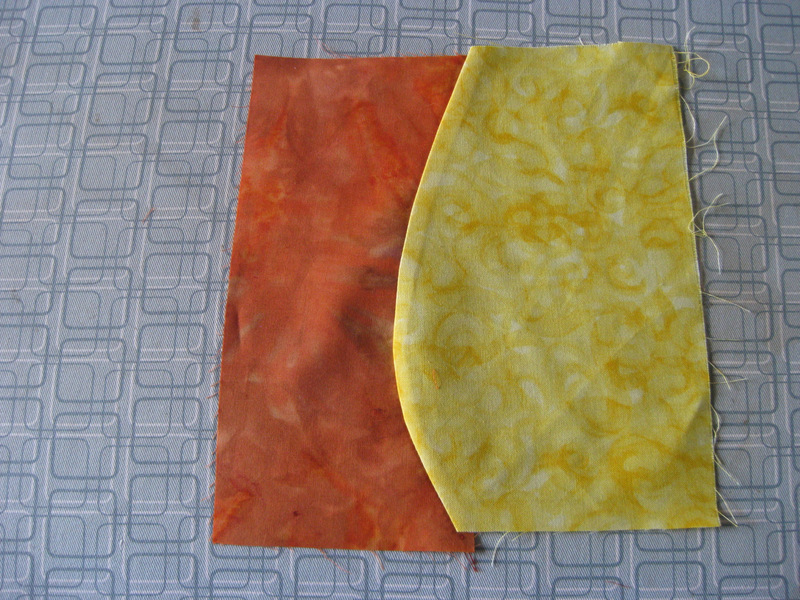 Take two fabrics, both with right side up. 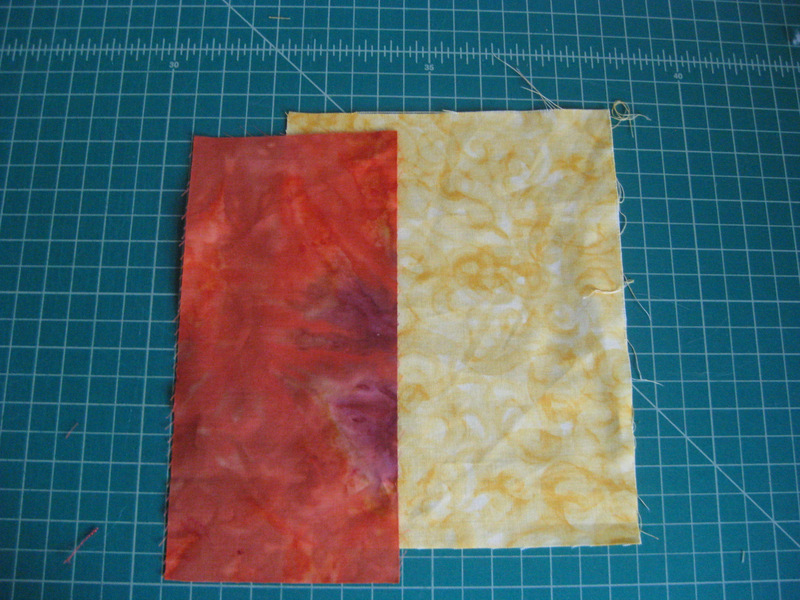 Overlap one on the other so you have the wrong side of one fabric on top of the right side of the second fabric. Cut what I refer to as a “wallpaper cut”. In my photo example I did a simple curved line in just one direction. 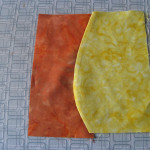 Remove the fabric you cut off from the top and bottom and line up two pieces for sewing, allowing for a 1/4″ seam allowance. 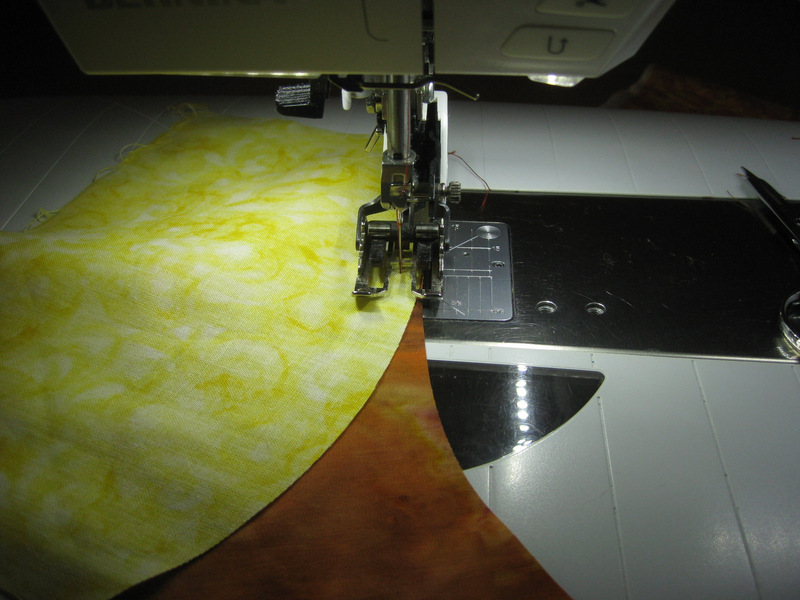 I’ve seen a variety of different tutorials that give you different ways to sew…check them out and decide what works for your machine and your skill. 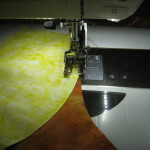 I have a Bernina 750 with some features that making sewing curves fun and easy such as a HOVER feature for my presser foot. 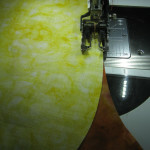 Be sure your machine stops with the needle DOWN. 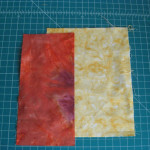 I sew about 1/2″ at a time and then readjust the fabric so you are easing the top fabric into a match with the bottom fabric for sewing. Some people use a lot of pins and work the curve together before beginning to sew but I have found I like the sew, pause, adjust, sew, pause, adjust method the best. 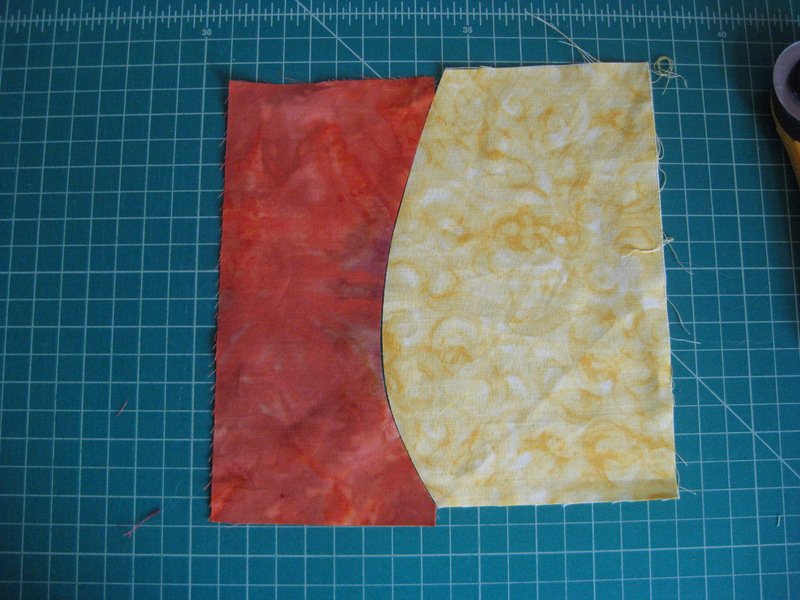 When finished, press the seam and you have pieced a curve! 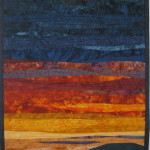 Check out my quilts in my Gallery and you will see that I use curved piecing A LOT!! Give it a try!